Evoke provides the option for users to have advanced sorting, searching and filterings enabled for any grid. The image on the right show where the option appears in the completed App. 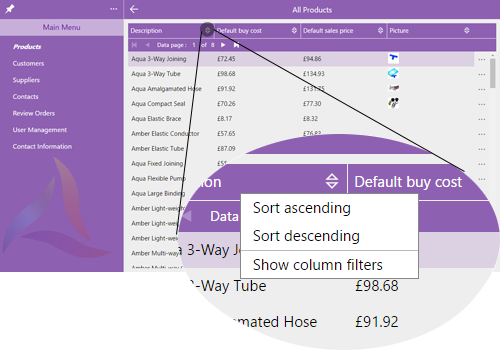 When using the App, the user will see the menu shown allowing them to sort, serach or filter. There is also a "Column Filters Help" option which will display, within the app, the Grid Filter Operators to help the user. If data paging is used then the search or sort will only operate on the data retrieved to the app through the paging and not on the backend database file data.